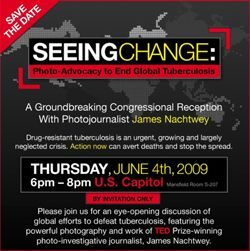 Publicizing the impact of tuberculosis on people around the world has become the passion of award-winning war photojournalist James Nachtwey, who has spent the last several years documenting the suffering and human toll taken by the disease. His photos, including images of GHC/CHC workers and patients in Cambodia, will be on view again at two upcoming events. His show, Struggle for Life, goes on exhibit at the Max Planck Institute for Infection Biology in Berlin for one month beginning May 23rd. The event will mark the 100-year anniversary of the isolation of the tuberculosis pathogen, Mycobacterium tuberculosis, by German scientist Robert Koch. The show features images of patients under the care of GHC/CHC, along with text by Dr. Anne Goldfeld, CHC co-founder and president of the CHC/GHC. Nachtwey will share the photos with United States lawmakers on June 4, at an invitation-only Congressional Reception at the U.S. Capitol in Washington, DC. In 2002, Goldfeld first asked Nachtwey to join her in a project that would document, through photos and words, the human toll taken by tuberculosis and AIDS worldwide, and the valiant efforts being made by people on the ground in Africa and Asia to fight the diseases. 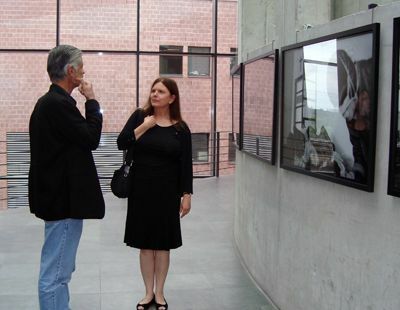 Since then, Nachtwey has mounted major exhibits at the United Nations in New York and in Paris that included images of TB patients in Cambodia and other countries. Last fall, he launched a media campaign to educate the world about drug-resistant tuberculosis, beginning with a slide show that premiered simultaneously in outdoor venues in major cities around the world. That work, funded by a TED Prize, also included the work of the CHC/GHC. Nachtwey's 2004 award winning photo essay of CHC/GHC's work "TB in Cambodia"